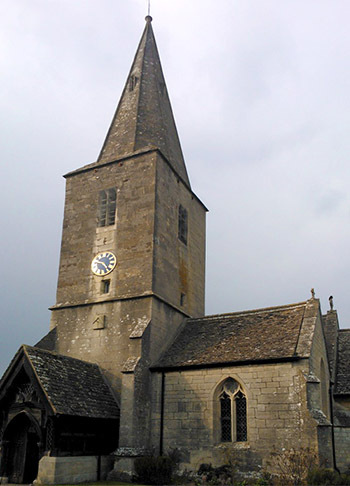 In addition to the small bell within the chancel, St James’ has eight bells within the tower and service ringing takes place every Sunday starting at 9.30am for the 10.30am Family Communion. Practice night is Thursday from 7.30pm until 9.00pm and visitors are always welcome. 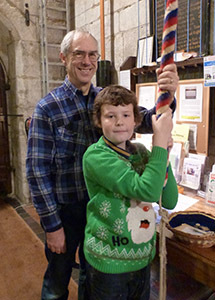 We also have a ‘silent’ ringing practice on Mondays, using our ‘simulator’, between 7:00 and 9:00pm. Quarter-Peals are arranged for occasional Sunday evenings and visitors should contact our tower captain on 01452 721683 if they wish to join us in a quarter-peal attempt. In addition, our Ringing Policy allows for four peals each year – one attempt by visitors and three others by the local band and friends. Quedgeley has a reasonably sized band of ringers, but additional cover is sought for Sunday Services and so new recruits are being sought in order to keep the band up to strength. Members of the band are also encouraged to improve their competence by attending such events as The Gloucester and Bristol Diocesan Association of Church Bell Ringers Training Days, plus outings and social events are frequently arranged. Our claim to fame at Quedgeley is that we are the ancestral home of the nationally renowned Young Bell Ringers Cycling Tour which celebrates its 40th year in 2013. The band took seriously the call to train ringers so that every tower in the land could ring their bells for the Millennium and we continue to train new ringers. Also, you may be interested to know that bell-ringers have their own weekly newspaper, and many websites provide additional resources for both learning and developing our art. St James’ Church has a delightful ring of eight bells that are rung regularly for Sunday services, practice nights, peals and quarter-peals. There is also a chiming apparatus that is used for weddings and daily service tunes. We are affiliated to the The Gloucester and Bristol Diocesan Association of Church Bell Ringers. In 1994 the bells were re-tuned by John Taylor Bell Founders of Loughborough and re-hung with all new fittings. The upper tier was rebuilt with a new RSJ frame. Ring of eight bells on two levels (1,2 & 5 on top). Quarter Peals Occasionally for special occasions, and by invitation or special arrangement. These normally last no more than one and a half hours from start to finish. Peal attempts No more than four per year, and by separate arrangement. These normally last for no more than four hours, and their arrangement will be separately posted. Weddings -As requested by each couple. Other special occasions -Christmas, Easter, New Year, Saints days….